Chester Terrill, who will turn 86 on April 30, uses cutting dies to cut leather at Highland Shoe in Brewer on Thursday. 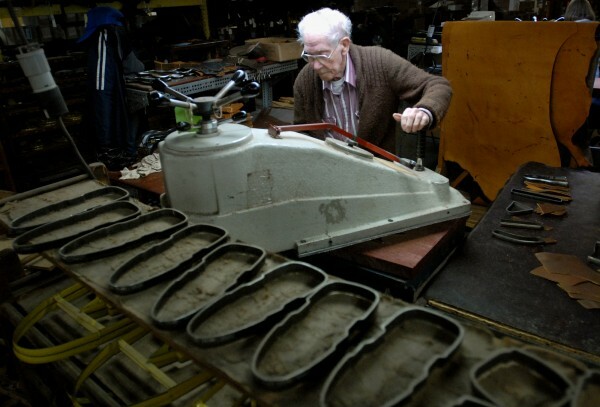 Terrill, who has worked in the shoemaking industry since 1948, has been employed at Highland for about 8 years. Adam Sutton, president of Highland Shoe in Brewer, looks over a product with employee Barbara White on Thursday. Steven Cyr hand sews a Sperry boat shoe at Highland Shoe on Thursday. A Japanese man with a love of hand-sewn moccasins — made using techniques that have been passed down from one generation of shoemakers to the next — traveled halfway across the world to find a Maine cobbler to make him a pair. Recent sales figures from Asia show the Japanese man is not alone in his love of Maine-made heritage brand shoes. While the once-thriving Maine shoe industry — the state’s largest manufacturing industry until the mid-1980s — has all but disappeared due to inexpensive Asian labor, a few companies have found a way to survive by selling their wares in Asia, coincidentally. In fact, hand-sewn American shoes almost have reached cult status in a number of Asian countries. “They want Made in the USA,” D’arcy Main-Boyington, Brewer’s economic development director, said recently. Shoemakers in Maine — Highland Shoe Co. of Brewer, Rancourt & Co. Shoecrafters of Lewiston and Quoddy of Perry — that make traditional hand-cut and hand-sewn leather shoes are seeing a resurgence in popularity of their heirloom-quality footwear among overseas customers, many in Asia. Highland annually makes around 25,000 shoes by hand for private labels such as Yuketen, Red Wing, Oak Street Bootmakers and Sperry Top-Sider Shoes and “50 to 60 percent of our shoes get shipped overseas somewhere,” company president Adam Sutton said recently. Quoddy produces only its own brand of footwear. Every year it makes just over 20,000 handsewn moccasins, and 25 percent of those go to Asian markets. Rancourt & Co., which produced about 50,000 hand-sewn shoes last year, recently began making its own brand, but also puts together high-quality shoes for Ralph Lauren, Red Wing and others. Around 10 percent are shipped overseas. All three Maine shoemakers say Asian sales are increasing. Shoes made by hand and stamped “Made in Maine, USA” are selling like hotcakes in Japan and other Asian countries, where tradition is held in high regard, said Kyle Rancourt, vice president of sales and marketing for Rancourt & Co.
Maine hand-sewn shoes are not inexpensive and cost even more in Asia, he said. “If a pair of shoes sells for $200 here, they’re selling for $300 over there,” Rancourt said. Red Wing, a brand produced by the Lewiston and Brewer shoemakers, last month kicked off a collection of hand-sewn shoes and boots that are all made in Maine. “Red Wing’s Genuine Handsewn Collection is crafted using century-old techniques that have been passed from hand to hand, generation to generation,” the company’s website states. Maine’s shoe industry, which started to bloom in the late-1800s and for decades was one of the state’s biggest employers, all but disappeared in the second half of the 20th century, when factories in the Far East, in countries such as China and Taiwan, began mass-producing cheap, disposable footwear. Maine’s role as the shoe capital of the world “was usurped by companies in Asia,” but that started to change in the mid-1990s when customers from Japan and other parts of the world started to invest in high-quality shoes made by hand, Andreliunas said. While the total number of Maine shoes exported decreased from $5.75 million to $5.67 million between 2010 and 2011, the total dollar value of the footwear heading to Japan, Hong Kong and the United Kingdom increased by at least 10 percent, according to Maine International Trade Center data. Hong Kong numbers jumped dramatically from around $205,000 in 2010 to more than $338,000 in 2011. The big decrease in Maine shoe exports was to Canada, which dropped from $2 million to $1.68 million between 2010 and 2011. The United States exported more than $1.28 billion in shoes during 2011. Genuine Made in Maine hand-sewn moccasins, which can be modernized with a dress sole, have been seen in fashion magazines and on fashion show runways in recent years and have attracted a following far and wide, Rancourt said. 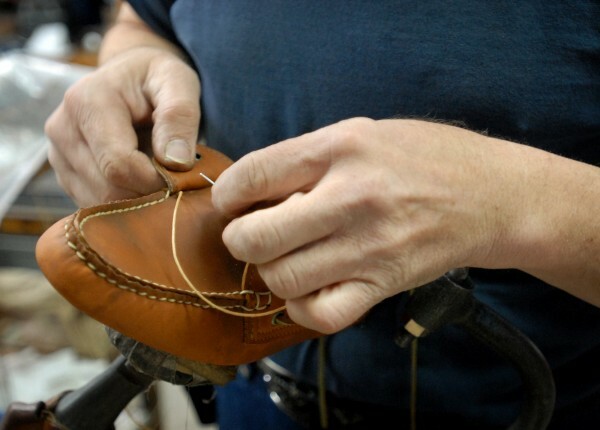 Mainers made more shoes than any other state in the nation until the early 1980s, when more than 16,500 workers were employed in the industry and another 5,000 in associated fields such as leather making. Combined, the two accounted for 15 percent of the state’s manufacturing work force. When imports skyrocketed in the United States in the 1980s, nearly 60 companies in Maine closed, laying off thousands of shoemakers. Just around 1,000 remain working today, 900 of those who work for New Balance Athletic Shoes Inc., which has sneaker factories in Norridgewock, Skowhegan and Norway. The rest use their hands to create the time-tested footwear that can last for years. Many of the state’s remaining cobblers have spent years honing their skills and create a quality product they can be proud of, Sutton said. One Highland employee, 84-year-old Chester Terrill, is a cutter for the Brewer company who has been making shoes since 1948. “I would say 90 percent of our people who work in the shoe factory have at least 20 years’ experience,” Sutton said. Quoddy footwear is sold by seven Japanese distributors and one in Hong Kong, and online to other Asian markets, the company president said. “It’s kind of ironic that the biggest new technology enabled the revival of a really old industry,” said Andrealiunas, who said Quoddy shoes have been shipped to more than 80 different countries. Despite the many shoe factories that have been shuttered in Maine over the last few decades, the traditions learned over a century ago in those buildings have survived the test of time. “I’d like to say 50 years from now that my son will take over the company and continue this tradition,” Rancourt said.